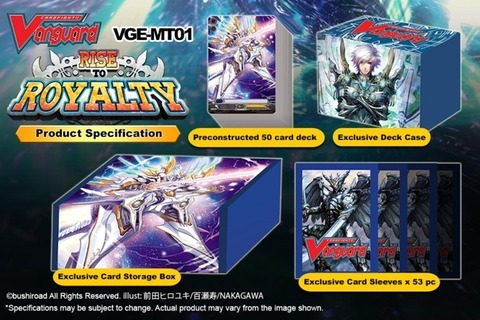 Images have surfaced of a new trial deck for the English format, VGE-MT01: Rise to Royalty. Marketed as a "Mega Trial Deck," this will be an English print of Japan's DAIGO Special Set released earlier in the year, redesigned for the American market due to musical artist Daigo's lack of popularity overseas. 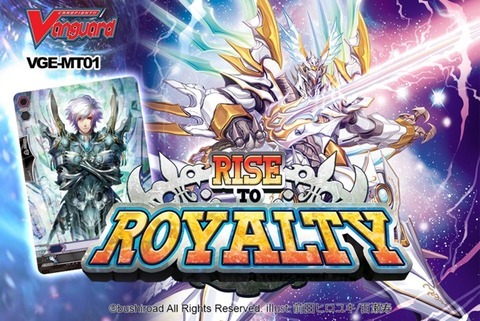 MT01 appears to be the Extra Trial Deck Bushiroad mentioned in one of their press releases, as in addition to the 50 Royal Paladin cards it contains it will also come with special deck box based on Starting Legend Ambrosius, as well as a Sanctuary Guard Dragon storage box and card sleeves based on Dignified Silver Dragon. Rise to Royalty is currently slated for a November 2013 release, making it unusable during the known dates set for Worlds 2013. The set's main upgrades to the Royal Paladins are Sanctuary Guard Dragon, a retooled version of the King of Knights Alfred designed around limit break and an 11000 power body, and the Jewel Knights that the deck brings in to help expand on the new Royal Paladins that will be introduced by BT10: Triumphant Return of the King of Knights. Its storyline is based around the ancient history and legends of the Royal Paladin clan, and the founders of the United Sanctuary.